Great bowling action or is it a celebration? Who can tell? 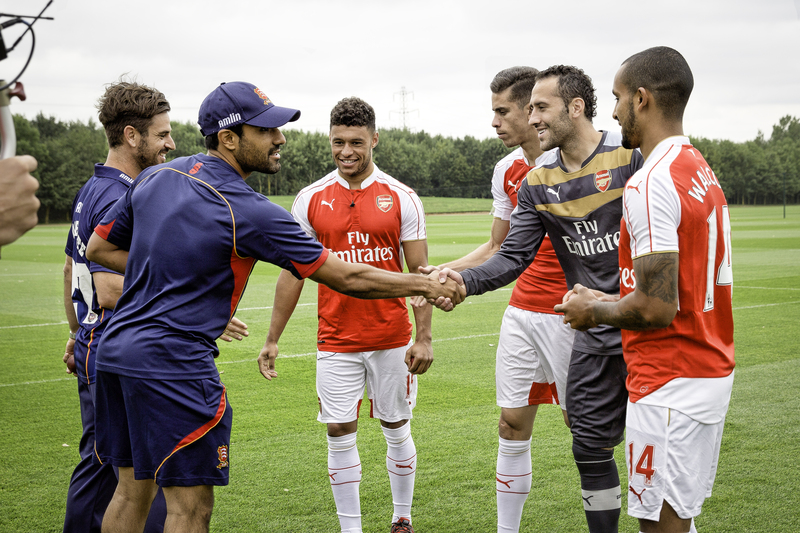 Arsenal Football Club invited IPL and and Essex cricketers, Ravi Bopara and Ryan ten Doeschate to the Arsenal Training Ground to take part in a cricket challenge earlier this month. The cricket duo taught newcomers to the sport David Ospina and Gabriel how to bowl, before taking part in a bowling competition. Each side bowled 6 times, with the team with the highest total amounts of wickets the winner. Alex Oxlade-Chamberlain shone during the competition, hitting the stumps twice for his team before beating Theo Walcott in the bowl off when scores were tied at 5 all. Now please Arsene let the Ox shine at St James Park tomorrow. Thanks to the AFC Media team as always and for all photos we thank Westney Phorography – Tom you are a star! “Striker Crisis!”: Arsenal fans missing the point – blaming Giroud achieves nothing. Dave, these photos you have used are mine and I would like to kindly ask you that on you credit me in posting (Westney Photography) – without a credit I do not want these images being used. Also for any further use of my images please contact me with regards to using the images before you do so. I have included my email on this submission please feel free to get in contact if you have any queries on the above. Apologies Amy. I received an email from Tom Bennett at the club with the file and he always asked me to Thanks AFC Media.